Time for an update on the Sunday-Monday system which has been pretty tricky to forecast. Although the overall pattern isn't the most supportive for a major Virginia snowstorm, there's been signs that things may line up just right to overcome that. Feel free to skip over the next few paragraphs of jargon to get to my thoughts. The synoptic setup actually reminds me a lot of what we saw with the March 2-3 snowstorm. A low pressure system is currently swinging across southeastern Canada. This will trail a weak cold front through our area during the day on Saturday before stalling out probably just south of the VA/NC border. This front won't produce much other than a some clouds and a few showers/sprinkles across western facing slopes. Behind the front, high pressure will work out of Canada into the Great Plains. The main difference will be the strength of this high. The one back on March 2/3 was up over 1040 millibars while this one will be somewhere in the low to mid 1030s, so the air-mass definitely isn't as cold. A low pressure system will develop in the southern plains before riding east along the boundary. 1) How strong and how far south is the high pressure over the Great Lakes? That will help determine the track of the primary low and strength of the cold air wedged into the mid-Atlantic. Today we've started to have a bit more operational model agreement concerning this. The evening 18z gfs and this afternoon's 12z Euro agree on the primary low pressure system developing in the general vicinity of Texas before tracking east into Arkansas and eventually the Mississippi Valley. They are also very similar with the strength and positioning of high pressure moving into the Great Lakes. The 12z Canadian along with the 12z Euro/Gfs ensembles means show nearly identical setups. With that much agreement less than 48 hours out, I think we are pretty close to the final solution regarding what happens with our storm initially. There should be enough lift out ahead of the low along the stalled boundary to produce some overrunning precipitation ahead of it. Showers will break out on Sunday from southwest to northeast. Cold air won't yet be established so most of this will fall in the form of rain. Temperatures will begin to fall Sunday evening into the overnight hours. Rain will change to snow from north to south and linger into the day on Monday. Of course higher elevations will be quickest with the changeover. 2) Onto the second question: Is there any upper level energy that gets left behind the primary low? There would be much more cold air in place behind the primary low for any sort of upper level energy to swing through after and produce a burst of snow. We've seen that quite a bit this year. Here is where the models really go their separate ways. The gfs and nam have tried to hold back an upper level low (ULL) and not swing it through until later in the day on Monday into Tuesday morning. The Euro and Canadian on the other hand have had the ULL right on the primary low's heels, swinging through early Monday morning. Below are two images (gfs left/euro right) for the same time Monday morning showing what I mean. The gfs/nam solution basically leads to a 2 part system, with boundary temperatures being able to rebound in-between due to a less organized, sheared out storm. The Euro and Canadian would allow the upper level energy to swing in right behind the initial low when cold air is already well established. This would allow areas as far south as even the VA/NC border counties to end as snow during the day Monday. I'm leaning towards this solution because I think it fits the progessive pattern better. The ridge out west that we had initially to produce our event quickly flattens with another system coming into the Pacific northwest. With this ridge collapsing, the upper level energy shouldn't be able to dig into Gulf states, but instead be pushed east like the Euro is showing. Rain will break out Sunday afternoon from southwest to northeast. Temperatures will cool from north to south, changing rain over to snow. There has been a lot of warmth out ahead of this system. Many areas reached well into the 60s on Friday with similar temperatures expected for Saturday. Sub-freezing temperatures and heavier snow can overcome this, but it definitely makes a difference when things are marginal. Most of the accumulation will occur Sunday night into Monday morning as the upper level energy swings through. The best shot at accumulating snowfall will be across the Shenandoah Valley and areas north of I-66 in northern VA. 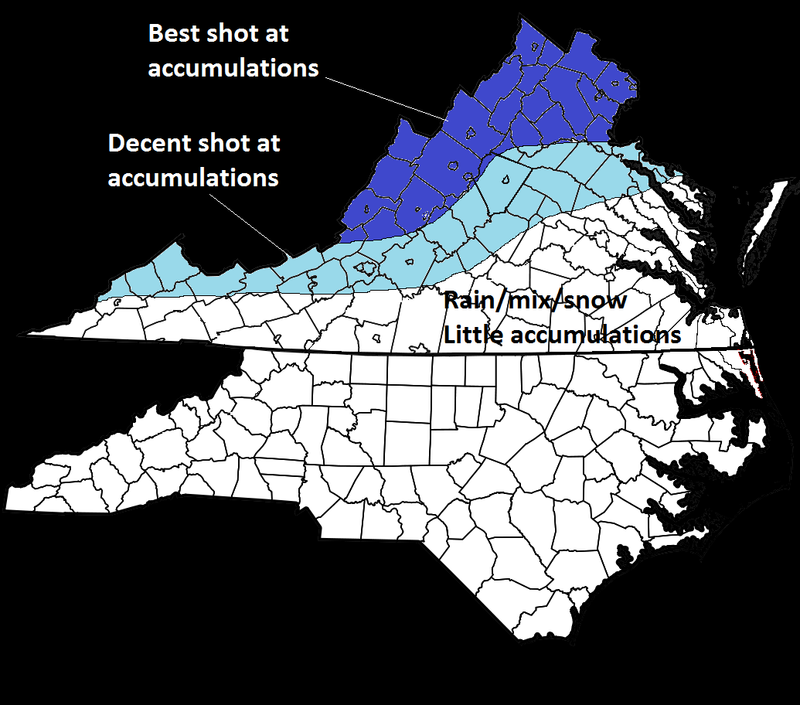 I wouldn't be surprised to see flakes and minor accumulations make it all the way down to the VA/NC border. The recent warmth and marginal boundary layer temperatures make me a bit skeptical, but today's model runs have me 1 foot through the door. I'll have my first call on amounts out by Saturday night.